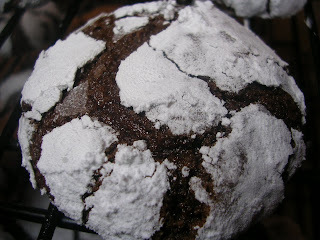 This was pulled directly from the great Artisan Bread in Five Minutes a Day Blog. I like to make it and bring to brunches or as an appetizer for dinner. It's so easy and impressive. You need the ABin5 brioche dough. This beautiful dough is so great. You literally just mix it up with a spoon, let it rise, throw it in the fridge and use it within a few days or freeze it, that 's it. I am begging you to try it. Then you jut defrost a package of spinach (or sautee some fresh with olive oil), spread it down the middle, pile on some feta cheese, some toasted pine nuts, "braid" it up, egg wash and bake for 30 minutes at 350. So years ago I was not eating meat, but wanted to serve something special for everyone at christmas. Frankly lots of vegetarian cookbooks claim that dishes are "perfect for the holidays"when really your average meat-eater doesn't want to come over and have what they consider a "side dish" (stuffed squash for example) for a main course. This pretty much leaves you with pasta. Another thing that lots of non-vegetarians don't want to find at your house: a main course based on beans. Justifiably or not they are afraid of them. Since I was never really a vegetarian, and always ate fish that usually left me serving fish to company. This is a really special fish dish that is not very hard to make, and perfect for the holidays - for real. I pulled this off Recipezaar.com - a very cool site where you can read people's reviews of recipes and search their database for what you want. I've found some winners on that site over the yeas. Make mushroom onion filling: Pulse the onions in the food processor until finely chopped. Melt butter or margarine in skillet and saute onion until lightly browned. Pulse the mushrooms in the food processor until the mushrooms are pretty finely chopped. Add mushrooms and thyme to the onions and cook, stirring, until most of the liquid has evaporated. Add the sherry and cook until the liquid has reduced. Add the cream and cook, stirring, until that has reduced. You will be left with a flavorful mushroom paste.Season to taste. Remove to bowl and chill. Roll half the pastry on a floured board into a rectangle approximately 14 inches long and 12 inches wide. Cut into 4 rectangles. You can cut decorations out of the corners here, they usually end up just being bulky and annoying. Tuck the thinner parts of fillet underneath, making them all the same thickness. Divide mushroom onion filling among the fillets and spread evenly on top. Cover each with a rectangle of pastry. Tuck 1/2 inch of pastry under fillets; trim off excess dough. It doesn't really matter how much goes under. 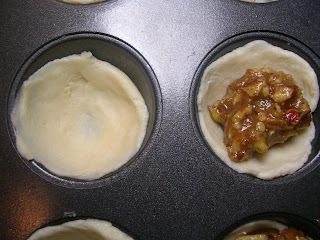 . .
Do not cover the entire bottom with pastry or it will become soggy. Brush top and sides with egg yolk glaze, being careful not to let glaze drip. Re-roll scraps of pastry and cut out small decorations. Place on Wellingtons and glaze the entire pastry again. *Maybe refrigerated up to 8 hours. Make light white wine sauce: Place wine, vinegar and shallots or onion in medium saucepan. Bring to a boil, lower the heat, and simmer until slightly thickened and reduced to approximately 4 tablespoons. Simmer, stirring occasionally, until sauce thickens to desired consistency. This will take a little time, but as the water evaporates from the cream, it will thicken. Stir in chives or parsley. 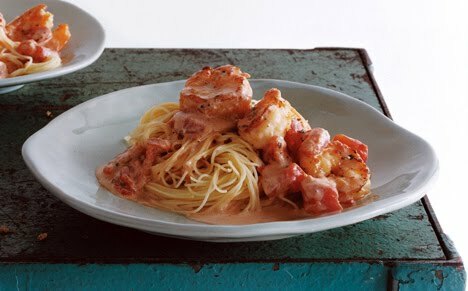 If sauce becomes too thick, thin down with additional wine or cream. Serve hot. Before serving, bring Wellingtons to room temperature for 1 hour. Bake Wellingtons for 20-25 minutes or until the pastry is golden. At this time, if the fillets are 3/4 inch thick, they will be moist and flaky. Spoon a small amount of sauce on each plate, place Wellingtons on sauce and pass remaining sauce. This chocolate cheesecake is so good. How good? Make it yourself and find out. I will say that it has been my daughter's birthday cake of choice since she was 4 years old, and she has a very sophisticated palate. Another brilliant thing about this cheesecake is that it actually tastes better if you make it in advance, like days in advance. You can still eat it the day after you make it, but it's great for those times when you'll need the last minute to deal with other stuff. . . like christmas for example. I got this recipe from my Aunt Joanne (I bet you're really surprised given the title of the post), and she's one in a long line of great cooks in my family. She said I could share it with you. Crush the wafers and combine with butter. This would be a good job for your trusty kitchen assistants. Press it into a 10" Springform pan (I always cover the bottom - outside- with foil since the first time I made it some butter leaked out and made my oven smoke. When I called my Aunt all panicky that's what she suggested I do). You can use the bottom of a flat cup measure to do this nice and evenly if you want. . .or you can let the kitchen assistants go to town with their hands, I opt for the former. 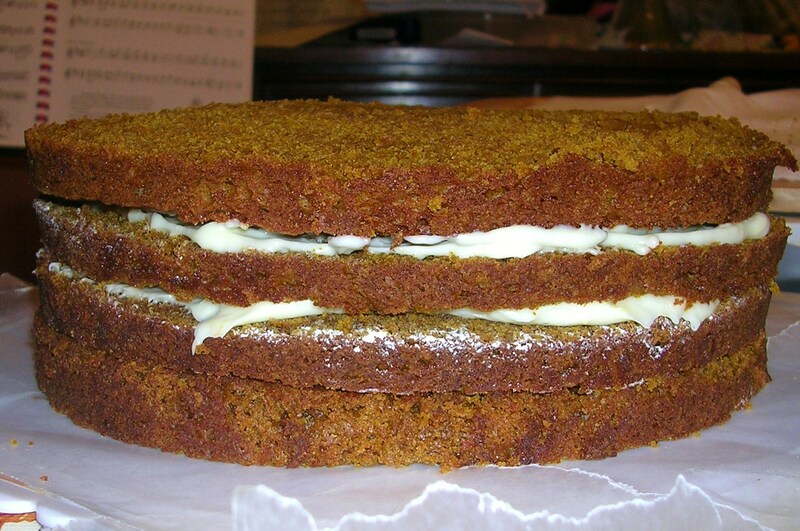 Chill the crust while making the cake. Melt the chocolate and cool it. Beat the cream cheese in a mixer until smooth. Add the sugar, and eggs (one at a time). Add the cooled chocolate, cocoa, vanilla and sour cream. Bake 45 minutes. The cake will be soft but will firm as it cools. Cool in the oven with the door open for 1 hour. Refrigerate at least overnight, and up to 5 days in advance. *1/3 of a cup. . . but that's not marked on the butter wrapper. . . throw this one at your kids: "Hey, if there are 16 tablespoons in a cup of butter how many tablespoons are there in a third of a cup. . . quick I need to know now!" - the answer, btw is 5 1/3 Tbsp. if you don't feel like doing the math and have no one around to badger about doing division and "real life math." Double duty kitchen/photo assistant at age 4. . . not too bad. This cookie seems to really appeal to the imagination, a whole piece of candy nestled in a cookie! This recipe is from the King Arthur Cookie Companion, a great book if you like to bake cookies. My kids love that there are several special jobs for them in this recipe. . . there's peeling the kisses (and eating a few), there's rolling the cookies in sugar and then there's placing the kisses smack in the center of the warm cookie without burning yourself, oh what fun. Cream the peanut butter, butter and sugars until light and fluffy. Add the egg, milk, baking soda, salt and vanilla. Gradually add the flour. Roll in white sugar. Bake for 10 minutes until light brown. Put a kiss in the center of each hot cookie, cool completely. I made up another batch of Pecan Tassies yesterday. . . mostly due to a certain 4 year old who feels that tons of cookies in the house means you can eat them whenever your mother is not looking. . . but I digress. This time I put less filling in them, and they were so much easier to get out of the pan, so that's good. I had about 1/3 of a cup of leftover filling, and I am far too thrifty to throw that away. I also had about a canteloupe sized ball of brioche dough in my fridge that needed to be used, so I rolled a little of that out and braided it over the filling.. . wish I had taken a picture of how easy that is because it sounds hard, but really there's not even any braiding involved. I'll take a picture when I do it again. Then I baked it. It is soo good, reminds me of really good Polish nut bread. I used the rest of the dough to make brioche rolls, which the kids subsequently slathered in Nutella and ate for breakfast. Now that I put the pictures up you can really see how lame the braid is, it can actually look quite good if you're not making it for no reason early in the morning and don't really care what it looks like. Also, don't be lazy like me - use egg wash on brioche. . . the shine will make all the difference. The brioche is from Artisan Bread in Five Minutes a Day Brioche Recipe. This is a wonderful and versatile recipe, I'll put up a bunch of other things to do with the dough later. It's so easy to make that my 4 year old usually does the mixing. . . I break the eggs and melt the butter and we're set. 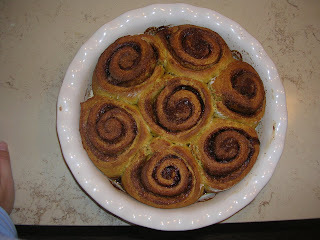 It makes wonderful special occasion rolls, sticky buns, spinach and feta braids, danish, oh the possibilities. . .
My kids, who claim not to like nuts can polish off a whole tray of these when I'm not looking. 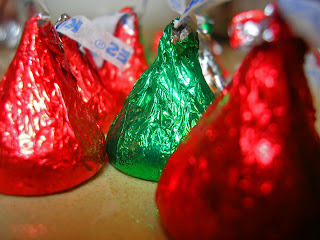 . . they remind me of a really great heath bar that won't break your teeth. Heat the oven to 350. 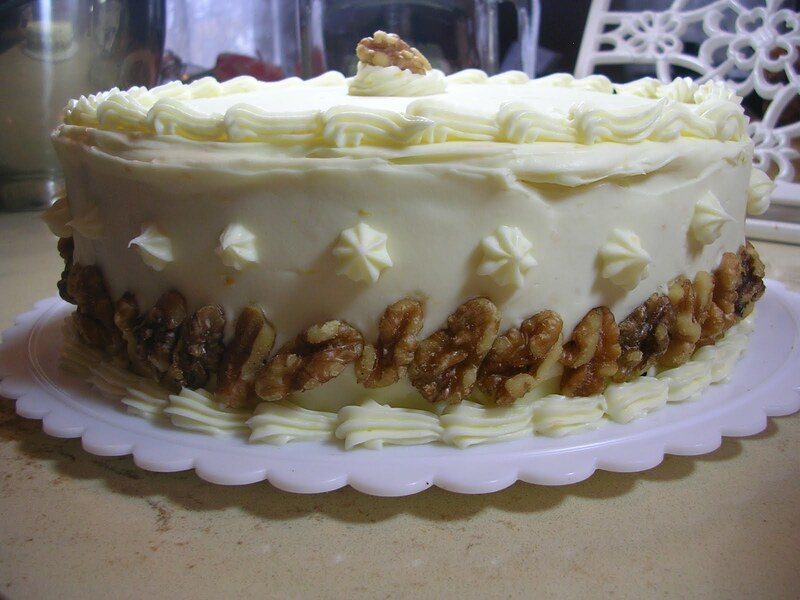 Spread the walnuts on a 15x10x1 inch jellyroll pan. (I have one I use only for this recipe. . . I hope yours is not an "airbake" like mine, I hate those things nothing ever browns properly in them) Toast the nuts for about 10 min. Cool them and chop them. In a mixer bowl cream the butter and the sugar, add the salt, vanilla and egg. Stir in the flour. Rub the butter wrappers on the pan to lightly greas it. Spread the batter in the pan. This will be a little harder than it sounds, just push it all in there with nice clean hands, the palm prints will go away while it bakes. Bake it for about 21 min. Sprinkle the chips on and bake another 5 minutes, spread the melted chocolate over the entire surface, then sprinkle on the nuts. Cool completely and cut (use a pizza wheel, it will be much easier) into diamonds. This is the kind of cookie I've never made, but the first one I'd go for on a cookie platter (or the big boxes of homemade cookies that used to arrive at our house from my mother's home state of Ohio around the holidays). I saw this recipe and had to try it, I tweaked it a bit. . . and it turned out quite well. 1/2 c. cream cheese (little more than half an 8 oz. package) at room temperature. 1 stick butter at room temperature. Preheat oven to 325. Spritz a 24 cup mini muffin tin with spray. Mix the butter, cream cheese, salt and flour together in a bowl. 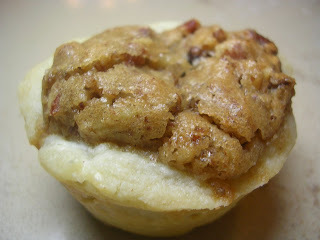 Press a good tablespoon into each mini muffin well, push it up to make a little shell. Mix the pecans sugar, butter, egg vanilla and salt together. Dollop a bit into the wells. 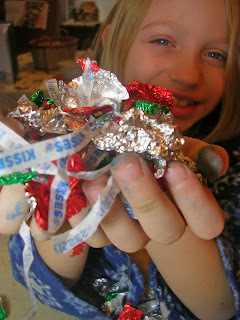 Don't overfill or itbecomes very difficult to get them out and you will have to eat the ruined ones! Bake 12 min or longer until the shells are slightly browned. Cool completely and remove. 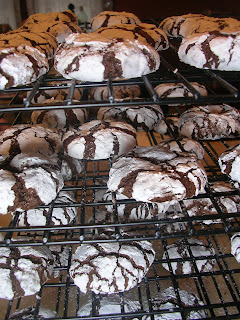 My children have dubbed these "Krinkle Klause" although the real name is the very cumbersome "Kris Kringle's Chocolate Krinkles." I"m pretty sure they just can't remember it. These come from DeDe Wilson's christmas cookie field guide. We double the recipe every year, because although it claims to make 80 cookies it really only makes 40. 1) Melt the chocolate and butter together over boiling water in a metal bowl (or whatever way you want to really). Remove from heat and stir until completely smooth. 2) Mix up the dry ingredients in a bowl. 3) In the bowl of an electric mixer beat the eggs and sugar and vanilla for about 2 minutes, until they're creamy. 4) Whisk in the chocolate/butter. 5) Mix in the dry. the batter will be thinnish, but that's o.k. because you're going to refrigerate it - 6 hours or overnight. 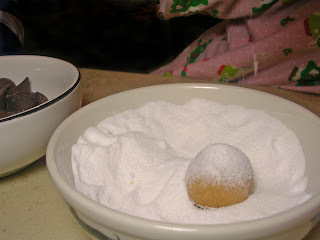 Put some confectioners sugar into a bowl, roll the dough into 1" balls and roll them (or have your kitchen helpers roll them. 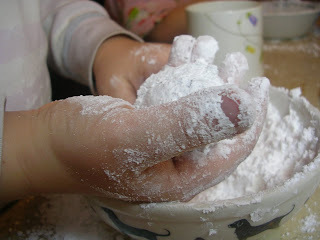 . . messy but fun) in the sugar. You want a thick coating. Place them 2" apart on a sheet and bake about 11-12 min. they'll be puffed and crackled. these keep pretty well if you can hide them. This is more a comment and a link than a real post, but as some of you know I am learning how to cook meat and I have found the pioneer woman's photos of every step of the way a great comfort in my ignorance. . . I made her braised shortribs on Friday night and they were. . . delicious! Here is the link to her Beef Shortribs - Heaven on a Plate. Check it out. What to make for breakfast? I've been doing some experimenting with Shirley O. Corriher's recipe's, from her book Bakewise. Shirley is a food scientist (and food lover). Her pumpkin pie was definately a standout at thanksgiving (and I don't really care for pumpkin pie to be honest, I only make it because my mom really likes it). 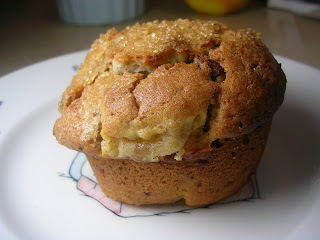 This morning I came back to a favorite: Dena's Great Apple-Walnut muffins from Bakewise. 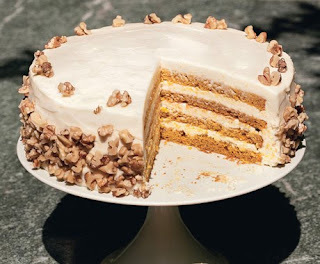 I haven't found the recipe online anywhere, so I'll post it here. 1 1/2 cups peeled, cored, and coarsley chopped apple. 1) while preheating your oven to 425 toast the walnuts in the oven for around 10 min. take them out toss them with the butter and 1/4 tsp. salt, let them cool then roughly chop them. 2) Mix the dry ingredients and then the toffee bits. 3) mix the wet igedients, including the zest, but NOT THE HEAVY CREAM. 4) Beat the cream until it makes soft peaks. 5) Stir in a little to lighten the batter, then fold in the rest. 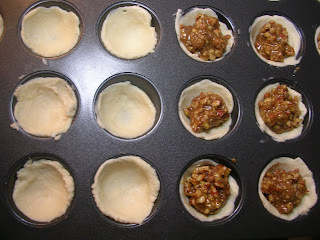 7) spray 12 muffin pans (this always makes 15 for me. . . ) Fill almost full, sprinkle the tops with demerera sugar if you like. . .
8) Put them in the oven and turn the heat down to 400. . . bake 15-20 minutes. Shirley swears by whipped cream to make a tender cake or muffin, and you can abuse this batter in ways that would make an ordinary muffin rubbery as long as you do it before you put in the cream. In fact, you might want to abuse them a little because otherwise they can crumble as you take them out of the pan they're so tender. 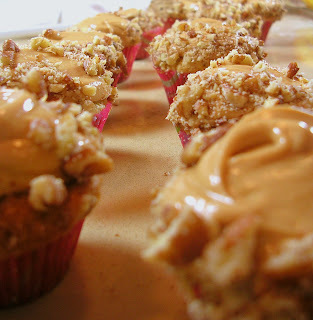 . . My kids love the sugary tops and the big sweet bits of apple in these.